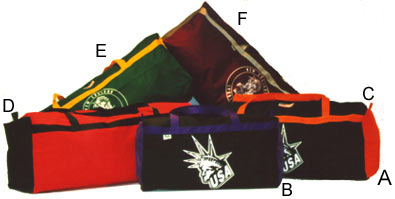 A new addition to the NESSI Custom Gear Bag Collection, the Economy Series is available in 6 different sizes for today's athlete, all bags are made from 600 Denier Polyester. They include the same outstanding quality canvas, poly handles, nylon zipper and workmanship as all other NESSI Bags but are geared more towards the price-conscious consumer. B) ECONOMY-MITE 28" x 13" x 13"
C) ECONOMY-INTERMEDIATE 32" x 15" x 15"
D) ECONOMY-PLAYER 36" x 15" x 15"
E) ECONOMY-GOALIE 40" x 15" x 15"
F) ECONOMY-JUMBO 44" x 15" x 15"